Walk this Way. Southern Living. July 2013. American Beauty. Atlanta Homes and Lifestyles. August 2012. An Oasis of Style. Southern Living. July 2012. A Soft Touch. Atlanta Homes and Lifestyles. April 2010. Meant to Be. Renovation Style. Winter 2010. Atlanta Ingenuity. Beautiful Homes. Summer 2009. Naturally Classic, Inside and Out. Southern Accents. May/June 2009. The Look of Georgian. Southern Accents. September/October 2008. Heirloom Cottage. Veranda. September 2008. Artful Gestures. Veranda. March 2008. The Other Shore: The Kiawah Credo Extends Across the Atlantic. Kiawah Island Legends. 2007. Family Heirloom. Southern Accents. September/October 2007. Fresh Palette in Soft, Sunny Tones. 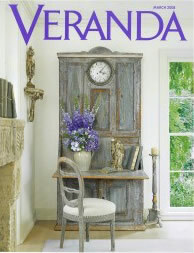 Veranda. May/June 2007. Crossroads. Atlanta Homes and Lifestyles. March 2007. Script Change. 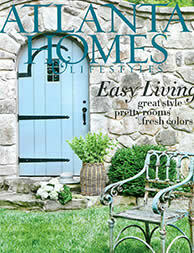 Atlanta Homes and Lifestyles. December 2006. Charleston Gem. Southern Accents. November/December 2006. Polished Beauty. Beautiful Southern Homes. Spring/Summer 2006. Totally Transformed: Upfront. Southern Living: Ultimate Before and After. March 2006. Home and Design. Southern Season. Winter 2006. Island Life, English Style. Coastal Living. October 2005. Simplicity and Repose. Kiawah Island Legends (Idea House). 2005. True South. Traditional Home. October 2004. Palm Beach Panache. Southern Accents. September/October 2004. Making A Second House a Home. Southern Accents. July/August 2004. Perfect Potager. Southern Accents. March/April 2004. 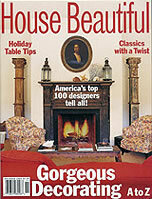 Haute Homes, Cool Spaces, Welcome Summer. Atlanta Homes and Lifestyles. June 2003. The Hand of the Craftsmen at the Heart of Cassique. Kiawah Island Legends. 2003. Cool and Collected. Southern Accents. September/October 2002. Masters of the House. Southern Accents. March/April 2002. Tribute: Beauty from Within. Veranda. May/June 2001. Collective Soul. Southern Accents. March/April 2001. High Contrast. House Beautiful. November 2000. Newly Old on Mobile Bay. Veranda. May/June 2000. A Fairy Tale Come True. Veranda. March/April 1999. Listening to the House. House Beautiful. February 1998. Into the Woods. Atlanta. Vol. 1, Issue 11. 1997. A Family in the Country. Veranda. Fall 1997. A Bloom; Romantic Harmony in Atlanta. Veranda. Spring 1997. Star Bright. Southern Accents. March/April 1996. Window of Opportunity. Southern Accents. March/April 1996. A River at My Garden’s End. Antiques and Garden Show. 1996. Mountain Greenery. House Beautiful. March 1997. Syllables of Eloquence; In the English Tradition. Veranda. Summer 1994. Refined Ranch. Southern Accents. September/October 1994. Living with Spirited Color. Southern Accents. September/October 1992. Restored, Simply. Southern Living. April 1992. A Colonial Christmas. Southern Homes. November/December 1991. Classic Cottage. Veranda. Summer 1990. Every Room with a View. Traditional Home. August 1989. Living Better at the Same Address. House Beautiful. 1988. Vintage Design Travels to Atlanta. Southern Living. June 1987. Sunroom Opens Up for Entertaining. Southern Living. April 1986. Working Arrangements. Home. April 1986. From Georgia Barn to Southern Belle. Home. January 1986. A Country Home in the Blue Ridge. Southern Accents. January/February 1985. Sully, Susan. Houses with Charm: Simple Southern Style. Sully, Susan. The Southern Cosmopolitan: Sophisticated Southern Style. Carabet, Brian G., et.al. Dream Homes: Georgia. Dallas: Panache Partners, LLC, 2007. Dowling, Elizabeth M. New Classicism: The Rebirth of Traditional Architecture. Stern, Robert A.M., comp. A Decade of Art and Architecture, 1992-2002. New York: Institute of Classical Architecture, 2002. Smith, Carter. Decorating with Americana. Birmingham: Oxmoor House, Inc., 1985. Askins, Norman D. (1994) The Boyhood Home of President Woodrow Wilson, August, Georgia. Askins, Norman D. (1982) The Tift-Willingham House, Tifton, Georgia. Askins, Norman D. (1980) Euharlee: An Historic Preservation Study. Askins, Norman D. (1980) Rhodes Memorial Hall. Askins, Norman D. (1980) Springfield Baptist Church, Augusta, Georgia. Askins, Norman D. (1980) The Haralson County Courthouse, Buchanan, Georgia. Askins, Norman D. (1979) A Plan for Barnsley Gardens. Askins, Norman D. (1979) The Old Campbell County Courthouse, Fairburn, Georgia. Askins, Norman D. (1979) The Rock House, Mcduffie County, Georgia.